Canadian investors and governments should reconsider how innovation is measured and place a greater emphasis on how existing technology is being used to transform old ideas, according to a new report. The Everywhere Everyday Innovating report, put together by the Bank of Montreal, Carleton University, the Beacon Agency and the Government of Canada, includes interviews from 146 women entrepreneurs throughout Canada, in all sectors and all stages of business from startup to multimillion-dollar businesses, including Indigenous women entrepreneurs. And while Canada has the second highest rate of female-led businesses within an innovation-based economy, the report suggests data often indicates that women are not as innovative as men, leading investors to more likely fund projects that create new technology. It’s an important conversation to have, says Nicole Verkindt, founder of Offset Market Exchange (OMX), and entrepreneurs should be rewarded even if they’re not necessarily creating brand new technology. Forty-six per cent of male respondents said they wanted to innovate so they can seek new technology, compared to 41 per cent of women. Women (76 per cent) were more driven to meet client or customer demands, compared to 67 per cent of men. “There should be different types of funding and support for those types of innovators,” she says, and the government should actively be tracking them. OMX is primarily a B2B platform that gives access to tens of thousands of companies by region, size, classification and capability, says Verkindt. It also helps those companies generate real-time analytics and reporting. The platform replaces what Verkindt describes as “old-school” methods of internal data management, such as Excel spreadsheets, that companies have relied on for far too long. 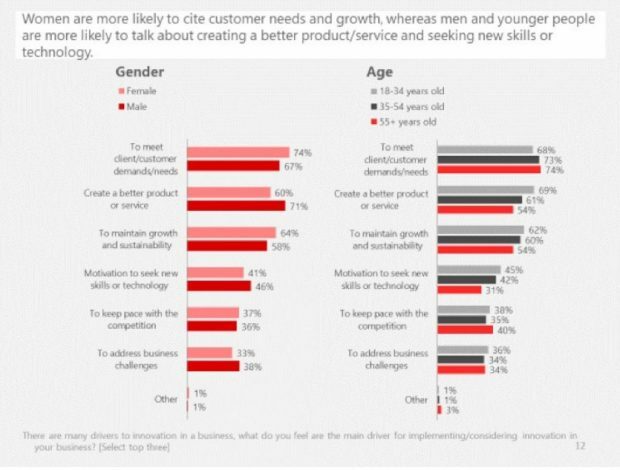 Women tend to innovate to meet customer needs and growth, whereas men and younger people are more likely to seek new skills or technology. Source: Everywhere Everyday Innovating report. OMX isn’t a brand new piece of technology, but it’s simplifying the process of accessing supply chains through a set of tools that can be used across multiple industries, explains Verkindt. Expanding the definition of innovation, however, doesn’t mean new technologies and scale-ups should take a back seat, she adds. If Toronto were to win the Amazon HQ2 bid, entrepreneurs will likely feel the pinch early, but down the road, the benefits will be much more evident, she says. “We’re going to increase our skill set and attract outside talent. Positioning Canada as a place where a large tech company can sell to the U.S. and every other country around the world … that’s good for the country,” says Verkindt.